Many people think tuberculosis is a disease of the past. But, tuberculosis is still a leading killer of young adults worldwide. Some 2 billion people – one-third of the world's population – are infected with the tuberculosis bacterium, M. tuberculosis. tuberculosis is a chronic bacterial infection. It is spread through the air and usually infects the lungs, although other organs are sometimes involved. Most persons that are infected with M. tuberculosis harbor the bacterium without symptoms but many develop active tuberculosis disease. Each year, 8 million people worldwide develop active tuberculosis and 3 million die. Tuberculosis is an infectious disease that usually infects the lungs, but can attack almost any part of the body. Tuberculosis is spread from person to person through the air. When a person with Tuberculosis in their lungs or throat coughs, laughs, sneezes, sings, or even talks, the germs that cause Tuberculosis may spread through the air. If another person breathes in these germs, there is a chance that they will become infected with tuberculosis. It is not easy to become infected with tuberculosis. Usually a person has to be close to someone with Tuberculosis disease for a long period of time. Tuberculosis is usually spread between family members, close friends, and people who work or live together. Tuberculosis is spread most easily in closed spaces over a long period of time. Once rare in developed countries, tuberculosis infections began increasing in 1985, partly because of the emergence of HIV, the virus that causes AIDS. HIV weakens a person's immune system so it can't fight the Tuberculosis germs. In the United States, because of stronger control programs, tuberculosis began to decrease again in 1993, but remains a concern. If it is not treated, Tuberculosis can be fatal. But Tuberculosis can almost always be treated and cured if you take medicine as directed by your healthcare provider. Once you begin treatment, within weeks you will no longer be contagious. That means you can't spread the disease to others. If you take your medicine just as your healthcare provider tells you, all the Tuberculosis germs should be killed. Is tuberculosis a problem in the United States? In the United States, tuberculosis has re-emerged as a serious public health problem. In 2001, based on provisional data reported to the U.S. Centers for Disease Control and Prevention, the number of cases has decreased for the ninth straight year to 15,991 cases of active tuberculosis (infection with full-blown disease symptoms). This all-time low is due largely to improved public health control measures. 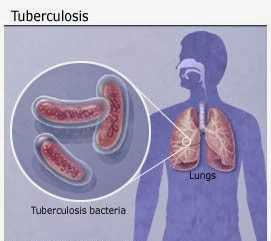 In addition to those with active tuberculosis, however, an estimated 10 to 15 million people in the United States are infected with M. tuberculosis without displaying symptoms (latent tuberculosis) and about one in ten of these individuals will develop active tuberculosis at some time in their lives. Minorities are affected disproportionately by tuberculosis: 54 percent of active tuberculosis cases in 1999 were among African-American and Hispanic people, with an additional 20 percent found in Asians. What caused tuberculosis to return? Although tuberculosis is contagious, it's not easy to catch. You're much more likely to get tuberculosis from someone you live with or work with than from a stranger. Most people with active Tuberculosis who've had appropriate drug treatment for at least two weeks are no longer contagious. The HIV/AIDS epidemic. People with HIV are particularly vulnerable to turn infection with M. tuberculosis into active tuberculosis and are also more sensitive to developing active tuberculosis when they are first infected with the tuberculosis germ. Increased numbers of foreign-born nationals from countries where many cases of tuberculosis occur, such as Africa, Asia, and Latin America. tuberculosis cases among those persons now living in the US account for nearly half of the national total. Increased poverty, injection drug use, and homelessness. tuberculosis transmission is rampant in crowded shelters and prisons where people weakened by poor nutrition, drug addiction, and alcoholism are exposed to M. tuberculosis. Failure of patients to take their prescribed antibiotics against tuberculosis as directed. Increased numbers of residents in long-term care facilities such as nursing homes. Many develop active tuberculosis from infections with M. tuberculosis that occurred much earlier in life because their general health has declined. Other elderly people, especially those with weak immune systems, become newly infected with M. tuberculosis and can rapidly develop active tuberculosis. Another reason tuberculosis remains a major killer is the increase in drug-resistant strains of the bacterium. Since the first antibiotics were used to fight tuberculosis 60 years ago, some Tuberculosis germs have developed the ability to survive, and that ability gets passed on to their descendants. Drug-resistant strains of tuberculosis emerge when an antibiotic fails to kill all of the bacteria it targets. The surviving bacteria become resistant to that particular drug and frequently other antibiotics as well. How do people catch tuberculosis? tuberculosis is primarily an airborne disease. The disease is spread from person to person in tiny microscopic droplets when a tuberculosis sufferer coughs, sneezes, speaks, sings, or laughs. Only people with active disease are contagious. It usually takes lengthy contact with someone with active tuberculosis before a person can become infected. On average, people have a 50 percent chance of becoming infected with M. tuberculosis if they spend eight hours a day for six months or 24 hours a day for two months working or living with someone with active tuberculosis. However, people with tuberculosis who have been treated with appropriate drugs for at least two weeks are no longer contagious and do not spread the germ to others. Adequate ventilation is the most important measure to prevent the transmission of tuberculosis. What happens to the body when a person gets Tuberculosis? When the inhaled tuberculosis bacteria enter the lungs, they can multiply and cause a local lung infection (pneumonia). The local lymph nodes associated with the lungs may also become involved with the infection and usually become enlarged. The hilar lymph nodes (the lymph nodes adjacent to the heart in the central part of the chest) are often involved. In addition, Tuberculosis can spread to other parts of the body. The body's immune (defense) system, however, can fight off the infection and stop the bacteria from spreading. The immune system does so ultimately by forming scar tissue around the Tuberculosis bacteria and isolating it from the rest of the body. Tuberculosis that occurs after initial exposure to the bacteria is often referred to as primary Tuberculosis. If the body is able to form scar tissue (fibrosis) around the Tuberculosis bacteria, then the infection is contained in an inactive state. Such an individual typically has no symptoms and cannot spread Tuberculosis to other people. The scar tissue and lymph nodes may eventually harden, like stone, due to the process of calcification of the scars (deposition of calcium from the bloodstream in the scar tissue). These scars often appear on X-rays and imaging studies like round marbles and are referred to as a granuloma. If these scars do not show any evidence of calcium on X-ray, they can be difficult to distinguish from cancer. Sometimes, however, the body's immune system becomes weakened, and the Tuberculosis bacteria break through the scar tissue and can cause active disease, referred to as reactivation tuberculosis or secondary Tuberculosis. For example, the immune system can be weakened by old age, the development of another infection or a cancer, or certain medications such as cortisone, anticancer drugs, or certain medications used to treat arthritis or inflammatory bowel disease. The breakthrough of bacteria can result in a recurrence of the pneumonia and a spread of Tuberculosis to other locations in the body. The kidneys, bone, and lining of the brain and spinal cord (meninges) are the most common sites affected by the spread of Tuberculosis beyond the lungs. How common is Tuberculosis, and who gets it? 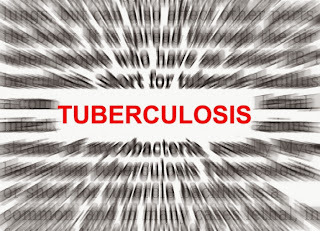 Over 8 million new cases of Tuberculosis occur each year worldwide. In the United States, it is estimated that 10-15 million people are infected with the Tuberculosis bacteria, and 22,000 new cases of Tuberculosis occur each year. There is no strong evidence for a genetically determined (inherited) susceptibility for Tuberculosis. These symptoms can also occur with other diseases so it is important to see a healthcare provider and to let them find out if you have Tuberculosis. A person with Tuberculosis disease may feel perfectly healthy or may only have a cough from time to time. If you think you have been exposed to Tuberculosis, get a Tuberculosis test. See your doctor if you have a fever, unexplained weight loss, drenching night sweats or a persistent cough. These are often signs of Tuberculosis, but they can also result from other medical problems. Your doctor can perform tests to help determine the cause. Doctors can identify most people infected with M. tuberculosis with a skin test. They will inject a substance under the skin of the forearm. If a red welt forms around the injection site within 72 hours, the person may have been infected. This doesn't necessarily mean he or she has active disease. 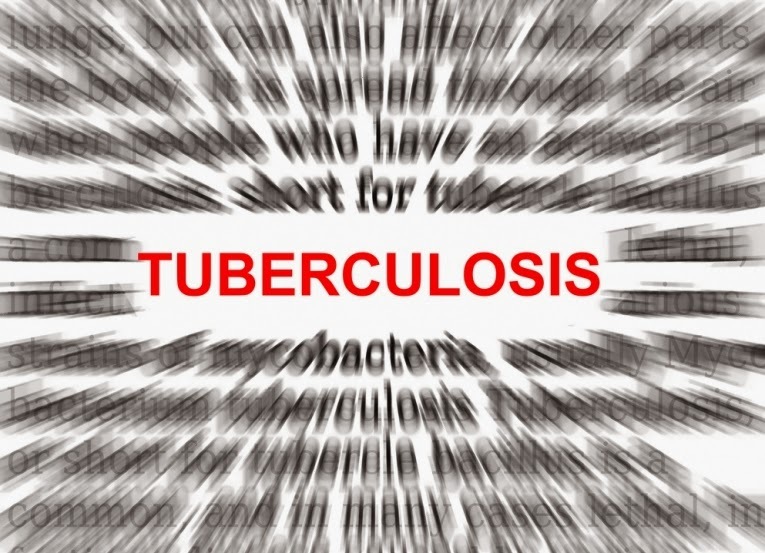 Most people with previous exposure to M. tuberculosis will test positive on the tuberculin test, as will some people exposed to bacteria that are related to the tuberculosis germ. If a person has an obvious reaction to the skin test, other methods can help to show if the individual has active tuberculosis. In making a diagnosis, doctors rely on symptoms and other physical signs, a person's history of exposure to tuberculosis, and x-rays that may show evidence of M. tuberculosis infection. The doctor also will take sputum and other samples, to see if the tuberculosis bacteria will grow in the lab. If bacteria are growing, this positive culture confirms the diagnosis of tuberculosis. Because M. tuberculosis grows very slowly, it can take four weeks to confirm the diagnosis. An additional two to three weeks usually are needed to determine which antibiotics the bacteria are susceptible to. Medications are the cornerstone of tuberculosis treatment. But treating Tuberculosis takes much longer than treating other types of bacterial infections. With tuberculosis, you must take antibiotics for at least six to nine months. The exact drugs and length of treatment depend on your age, overall health, possible drug resistance, the form of Tuberculosis (latent or active) and the infection's location in the body. A recent study suggests that a shorter term of treatment — three months instead of nine — with combined medication may be effective in keeping latent Tuberculosis from becoming active Tuberculosis. With the shorter course of treatment, people are more likely to take all their medication and the risk of side effects is lessened. More study is needed. There's some evidence that taking vitamin D during tuberculosis treatment enhances some of the effects of the drugs. More study is needed. After a few weeks, you won't be contagious, and you may start to feel better. It might be tempting to stop taking your Tuberculosis drugs. But it is crucial that you finish the full course of therapy and take the medications exactly as prescribed by your doctor. Stopping treatment too soon or skipping doses can allow the bacteria that are still alive to become resistant to those drugs, leading to Tuberculosis that is much more dangerous and difficult to treat. To help people stick with their treatment, a program called directly observed therapy (DOT) is sometimes recommended. In this approach, a health care worker administers your medication so that you don't have to remember to take it on your own. With appropriate antibiotic treatment, tuberculosis can be cured in more than nine out of ten patients. Successful tuberculosis treatment depends on close cooperation between the patient and doctor and other health care workers. Tuberculosis treatment usually combines several different antibiotic drugs which are given for at least six months, sometimes for as long as 12 months. Patients must take their medicine on time every day for the 6 to 12 months. Some tuberculosis patients stop taking their prescribed medicines because they may feel better after only a couple of weeks of treatment. Another reason they may stop taking their medicine is because tuberculosis drugs can have unpleasant side effects. Why is it so important to finish all of the tuberculosis medicine? If patients don't take all their medicine the way their doctor tells them, they can become sick again and spread tuberculosis to their friends and family. Additionally, when patients do not take all the drugs the doctor has prescribed or skip times when they are supposed to take them, the tuberculosis bacteria learn to outwit the tuberculosis antibiotics, and soon those medications no longer work against the disease. If this happens, the person now has resistant tuberculosis infection. Some patients have disease that is resistant to two or more drugs. This is called multidrug-resistant tuberculosis or MDR-tuberculosis because the tuberculosis germ, M. tuberculosis resists eradication with more than drug. This form of tuberculosis is much more difficult to cure. If you test positive for latent Tuberculosis infection, your doctor may advise you to take medications to reduce your risk of developing active tuberculosis. The only type of tuberculosis that is contagious is the active variety, when it affects the lungs. So if you can prevent your latent tuberculosis from becoming active, you won't transmit tuberculosis to anyone else. This is the most important step you can take to protect yourself and others from tuberculosis. When you stop treatment early or skip doses, Tuberculosis bacteria have a chance to develop mutations that allow them to survive the most potent Tuberculosis drugs. The resulting drug-resistant strains are much more deadly and difficult to treat. In countries where tuberculosis is more common, infants often are vaccinated with bacille Calmette-Guerin (BCG) vaccine because it can prevent severe tuberculosis in children. The BCG vaccine isn't recommended for general use in the United States because it isn't very effective in adults, and it causes a false-positive result on a Tuberculosis skin test. Researchers are working on developing a more effective Tuberculosis vaccine. In those parts of the world where the disease is common, the World Health Organization (WHO) recommends that infants receive a vaccine called BCG made from a live weakened bacterium related to M. tuberculosis. BCG vaccine prevents M. tuberculosis from spreading within the body, thus preventing tuberculosis from developing. However, the vaccine has its drawbacks. It does not protect adults very well against tuberculosis. In addition, BCG interferes with the tuberculosis skin test, showing a positive skin test reaction in people who have received BCG vaccine. In countries where BCG vaccine is used, the ability of the skin test to identify persons that are infected with M. tuberculosis is limited. Because of these limitations, more effective vaccines are needed and BCG is not recommended for general use in the United States. How is M. tuberculosis infection different in people with HIV infection? The World Health Organization (WHO) estimates that 10 million people worldwide are infected with the M. tuberculosis bacterium and HIV virus at the same time. The primary cause of death in these patients is from tuberculosis, not AIDS. In the United States, it is estimated that about 2 out of ten persons who have tuberculosis are also infected with HIV. One of the first indications that a person is infected with HIV may be that he or she suddenly develops tuberculosis. This form of tuberculosis often occurs in areas outside the lungs, particularly when the patient is in the later stages of AIDS. In the United States, it is much more likely for persons infected with M. tuberculosis and HIV to develop active tuberculosis than it is for someone that is only infected with M. tuberculosis. However, tuberculosis disease can be prevented and cured, even in people with HIV infection. People with MDR-tuberculosis that are also infected with HIV appear to have a more rapid and deadly disease course than do those patients with MDR-tuberculosis who are otherwise healthy. If no medicines are available for these patients as many as eight out of ten may die, often within months of diagnosis. Diagnosing tuberculosis in HIV-infected people is often difficult. HIV infected patients frequently have disease symptoms similar to those of tuberculosis, and may not react to the standard tuberculosis skin test because their immune system does not work properly. X-rays, sputum tests, and physical exams may also fail to provide evidence of infection with M. tuberculosis in HIV-infected individuals. You will need regular checkups to make sure your treatment is working. You must finish your medicine and take the drugs exactly as prescribed. If you stop taking the drugs too soon you can become sick again. If you do not take the drugs correctly, the Tuberculosis germs that are still alive can become resistant to the drugs. A healthcare worker may make sure you are taking your medicine correctly. This is called Directly Observed Therapy (DOT). How is research helping the fight against tuberculosis? Diagnosis: Potential new tests to speed the diagnosis of tuberculosis from four weeks to two days; differences found in the DNA of M. tuberculosis and the bacterium used in the BCG vaccine may lead to a test to tell the difference between people who really have tuberculosis and those who only react to previous BCG vaccination. Treatment: Discovery of the molecules responsible for drug resistance, knowledge that will help doctors quickly select the best treatments for their patients; a new drug under study can be taken less often to help patients comply with their treatment regimen. Vaccines: More than 90 vaccine candidates have been developed and tested in animals.